Do you wish you felt more confident in choosing and implementing clinical materials and technologies? Would you like to expand the range of procedures in which you are confident in providing patients? Are you so involved in ‘doing’ dentistry that you don’t know what’s ‘happening’ in the clinical and business sides of the practice? Determine which technologies would have the greatest impact on the difficulty/ease of doing dentistry, how they improve clinical care and the financial impact on both the patient and the practice. For example, laser-assisted dentistry, intraoral camera, same day (CAD/CAM) dentistry, panoramic x-ray, etc. Improve clinical standards in patient care including the new patient exam, oral cancer screening, periodontal protocol, fluoride, x-ray, caries risk, re-care exam, patient handoff and delegation of duties. Gain the confidence and skill to bring the procedures you’re referring out… back into the practice. Build a strong, cohesive team; refine communication and delegation skills. Passionate and inspiring. Dr. Bregman’s experience comes across clearly to a broad audience, making him an accessible and valuable trainer. What can I say but EXCELLENT! I look forward to implementing the concepts that I learned. Brought me back to focus right where it should be: excellent patient care! This course was great! I stayed focused and learned a lot. Dr. Bregman’s passion makes me want to incorporate what I learned into my practice and into my life. 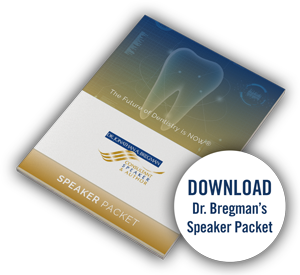 Dr. Bregman is an extremely knowledgeable and experienced speaker who delivers a great dental message with powerful passion. Through a unique perspective, wonderful humor and his own clinical cases, he lets us clearly know that the future of dentistry is right here and right now. Dr. Bregman’s lecture was very informative and he is a very enthusiastic speaker. He keeps you involved and part of the lecture. An excellent experience. You must take Dr. Bregman’s course! I was very impressed with the amount information in Dr. Bregman’s lecture and I’m excited about informing my patients about early oral cancer detection and confident in being able to effectively screen each and every one of my patients. Dr. Bregman teaches with passion. He wants us to improve the quality of care for our patients and ultimately society. It was easy to learn because he makes it relevant. Great communication skills, clear achievement of goals. Dr. Jonathan Bregman is an awesome instructor, meeting the needs of all learning types. He is extremely knowledgeable of the material and great information was given. Absolutely an eye-­opening seminar. Kept my attention the whole time! Dr. Bregman is passionate about early oral cancer detection. The educational skills he brought to the lecture helped ensure on-­‐site learning. Bravo. Dr. Bregman is an extremely knowledgeable and experienced speaker and coach who delivers a great message with powerful passion. Through a unique perspective, wonderful humor and his own clinical cases, he lets us clearly know that the future of dentistry is right here and right now. Georgia Passionate and inspiring. Dr. Bregman’s experience comes across clearly to a broad audience, making him an accessible and valuable speaker. Two thumbs up for an outstanding presentation; lots of info to use in my practice, presented with vitality and energy to keep me engaged. Dr. Bregman’s seminars are full of valuable information. He teaches with passion and integrity. Anyone attending his courses is sure to come away with valuable tools, increased knowledge and renewed passion for dentistry. Wonderful learning experience. Fabulous fund of knowledge. Very practical techniques. Helps save lives. I highly recommend his course. Wonderful learning experience. Fabulous fund of knowledge. Very practical techniques. Helps save lives. Highly recommended. Website design by Lena Shore.